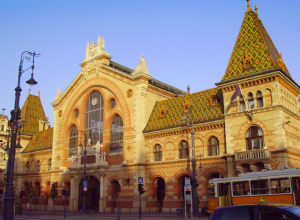 The Great Market Hall in Budapest (in Hungarian Nagycsarnok or Vasarcsarnok) was built in 1897, and is the most beautiful and largest of all Budapest market halls (yes, there are more historical market halls in Budapest, like the one in Hold Street called the Downtown Budapest Market Hall). 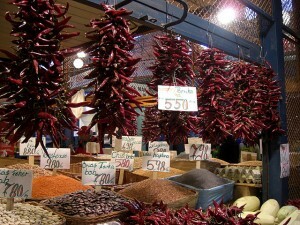 The market hall is not only ‘Great’ in its size, but is also great in other aspects. 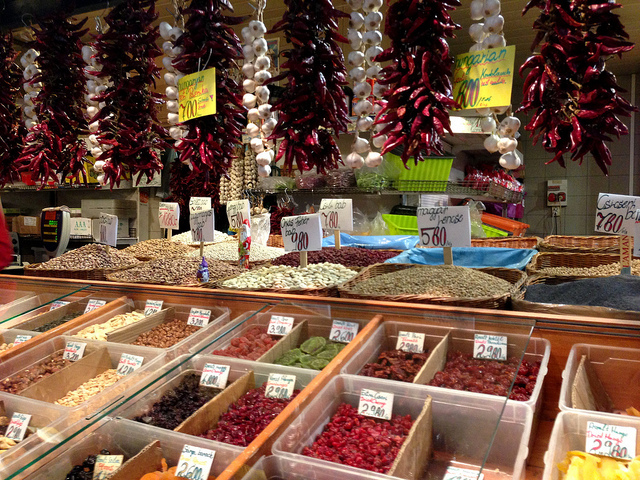 Most importantly the market is also central, no wonder it is also called the Central Market Hall, for both of its location (5 min walk from the city centre), and the volume of trade taking place here on a daily basis. 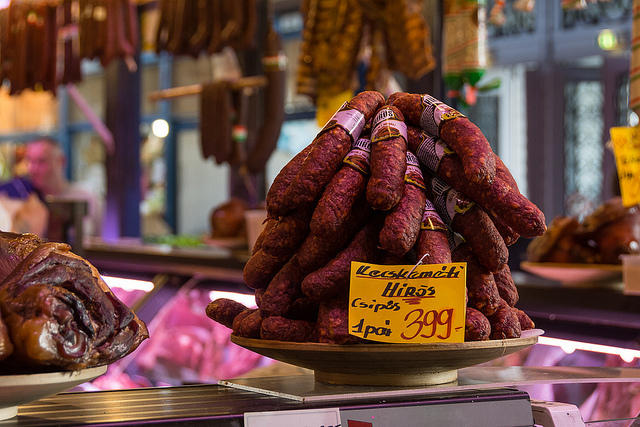 See the Opening Hours of the Great Market Hall here. If you love fresh goods, people watching, shopping, photo opportunities, guided tours with tastings, or just sightseeing in amazing places, we trust you will enjoy visiting our beloved Great Market Hall. 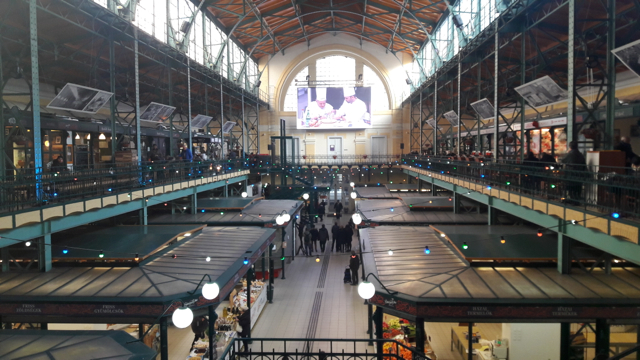 No matter if it rains or shines, the Great Market Hall is a great option, and definitely one of the top Budapest attractions according to many Budapest guides. You can get all sorts of goods on the 3 floors of the Great Market Hall of Budapest: fruits, vegetables, dairy products, fantastic salamis, pickles, fresh fish, Hungarian paprika, Tokaj wines, various souvenirs, bags, clothes, pans and pots, and even home style meals, or Hungarian snacks like Langos at the upper floor food stands and eateries. 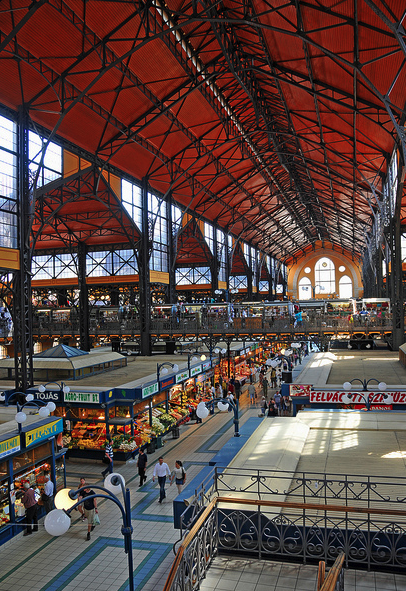 You may wonder when it is the best time to visit the Budapest Great Market Hall. We often get this question, and the answer is, it depends. Definitely on a Saturday or not on a Sunday, depending on what you like. Buzz, lively programmes and/or guided tours? Saturday! Quiet, peaceful browsing and architectural photo shoots? Not on a Saturday. 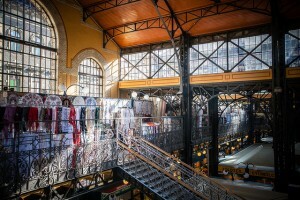 In contrast to shopping malls in Budapest, the modern markets of consumerism, Budapest market halls are not open on Sundays. The market is open from Monday to Saturday, so schedule your market tour by taking into consideration the current opening hours. 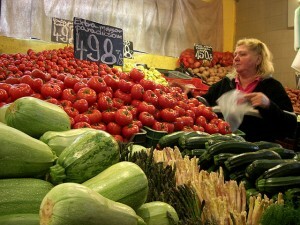 If you want to avoid the crowds, do not get up early to get to the market. Housewives, and market goer locals in general do the early morning shopping until about 8-9am from Monday to Friday. It is especially true of Saturday mornings when many buyers have a bit more time to browse the markets on their free days. Moreover, Budapest weekend getaways are quite popular among tourists (local and foreign tourists alike), so Saturdays in general are busier. Unless you want to take photos of a busy market scene, you had better come late morning or early afternoon during the weekdays when most locals are at work and only some pensioners, tourists and stay at home parents run errands. Lunch time, however, is the midday peak hours as many locals and tourists pop in for a quick snack, or cheap lunch between 12 pm and 2 pm. 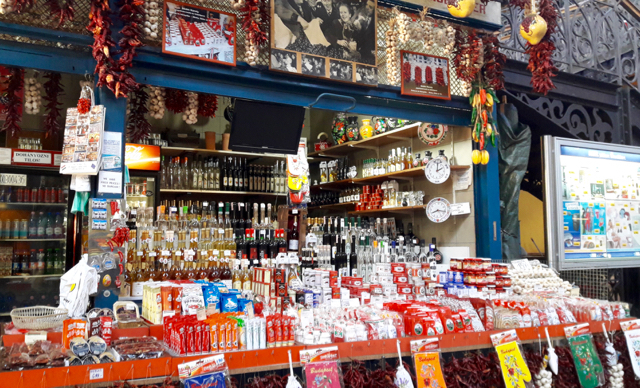 We advise tourists to visit the Budapest Market Hall between 10 am and 12 pm or 2 pm and 4 pm as the best time to get the most out of your visit if you are taking a self guided tour. Saturdays are special as many Saturdays, throughout the year, offer a special Cultural Day when one of the countries in the world (from Indonesia to Sweden) showcase their products, travel destinations, offer some live music / show and some food tastings. Saturdays are also the days for the regular budget guided tour. can I find wild mushrooms in this market tomorrow november 11? Does anyone know how to contact the people that organise the Pálinka making in the Grand Hall ? 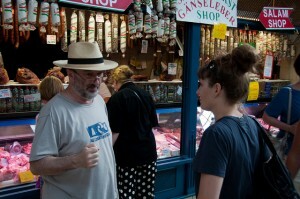 Hello, is the market hall open during Easter? Thanks for answer. What kind of fish do they sell in the lower level? Pingback: Business Opportunity, Home-Based Business, Work From Home, Luxury Travel. 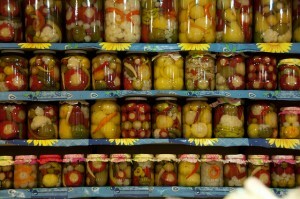 Pingback: Her Design World | Budapest : 20 amazing things to do! Pingback: Which Is The Best Hungarian Paprika And Why? Pingback: Budapest – Have suitcase. Will travel.